Many industrial applications involve fluid flow through porous media that directly affects their performance. Filters, packed beds and perforated plates are some of the examples of porous media through which fluid flow occurs. While different phenomena and multiple fluid phases exist, it is extremely complex to determine the efficiency of the media through physical experimentation. There might be complex chemical reactions as well within the medium such as in the case of a catalytic converter, which further adds to the complexity of determining system performance and efficiency. While experiments do help designers in refining the system design, they are often costly and time consuming. 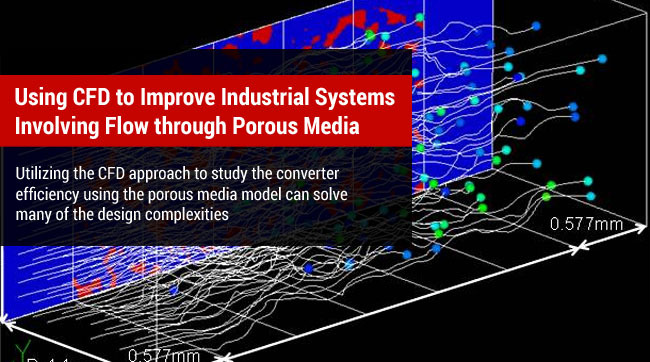 An alternative to this approach is to utilize computational power to do all the calculations using CFD porous media model. Knowing the parameters such as porosity and permeability of the porous media, governing equations such as Darcy and Brinkman equations (extension of Navier-Stokes Equation) can be solved through finite element technique. Important properties such as pressure drop, velocity, heat and mass transfer as well as species transport can be determined through multiphase flow analysis. The use and benefits of porous media model can be realized through its application to study the catalytic converter efficiency; the device used to control exhaust emissions from the vehicles. The honeycomb structure inside the catalytic converter works as a catalyst and converts harmful CO, HC and NOx gases to CO2, water and Hydrogen. The structure is composed of catalyst materials such as Rhodium, Palladium and Platinum that helps in the chemical reaction process. It is this honeycomb block that would decide the efficiency of the catalytic converter and as such placing the block at the right location inside the converter housing is important. Also, the materials used as catalysts are highly expensive and using them excessively would also costly for the manufacturer. Utilizing the CFD approach to study the converter efficiency using the porous media model can solve many of the design complexities and can provide designers a clear perspective on keeping the converter design efficient and cost effective. CFD solutions can help in identifying species concentration of the exhaust gas through solving chemical kinetic equations. This can help in determining how effective the porous medium and allows designers to place the block accurately inside the housing. The dimensions of the catalyst block can then be adjusted to prevent utilization of excessive material and keep the design cost effective. Designer can compare the old and new design with suitable temperature and species concentration data to measure the effectiveness of the converter more accurately. About Author: Mehul Patel specializes in handling CFD projects for Automobile, Aerospace, Oil and Gas and building HVAC sectors. He works as a CFD consultant with Hi-Tech CFD for the past 5 years and has successfully executed numerous CFD projects of high complexities. He is an expert in turbo-machinery, gas dynamics, Combustion, Fluid Dynamics, multiphase flow analysis, computational fluid dynamics etc. How CFD Helps in Reducing Prototyping Trials? CFD For Turbomachinery Parts; Should Manufacturers Really Adopt It? When to Deem a CFD Solution Converged?